Candle wick care is an important part of maintaining your candles so that they will burn cleanly and safely. It only takes a few simple steps to keep your wicks in great shape for optimal burning. When you consider a candle, you think of things like colourful wax, lovely shapes, and captivating scents. The wick itself is actually an integral part of the candle, however, ensuring an even flame and clean wax melt. If the wick is too thin, the flame will be small and burn a tunnel through the middle of the candle. 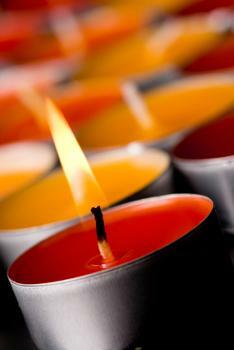 If the wick is too thick or large, it will burn too hot and cause the wax to melt too quickly. Candle wick care begins even before you bring a new candle home. Here are a few things to look for in a wick when selecting new candles for purchase. Check to make sure the wick isn't frayed. Frayed ends can indicate a low quality wick, or a candle that has been in storage for long periods of time. Wicks shouldn't be too short. If a new candle wick is less than 1/4 inch in length, skip the candle all together. Very old wicks can become discolored and appear brownish, so take a pass on these as well as any that are covered in dust. The wick should be centered well inside the candle, or in the case of candles with multiple wicks, they should be evenly spaced. Avoid any candles with wicks that appear off center or crooked. When you're ready to light a new candle, check it first to make sure the wick is free of any dust or debris which could cause the flame to crackle or sputter.Trim the wick to 1/4 inch in length before lighting. You can use fancy wick trimmers that will measure the height for you as you cut, or opt for a simple pair of scissors. Never use a knife or other jagged edge to trim your wicks, as these will result in a frayed end. Lightly tug the wick upwards so it's standing straight. In the case of multiple wicks, the ends should be facing slightly inwards before lighting them. Candles can be lit over and over again, especially large candles like pillars or container candles. Here are some tips to make sure your wick stays in great shape through multiple uses. Use a candle snuffer to put out your candles. Snuffers can be found anywhere candles are sold, and many are very inexpensive. The advantages to using a candle snuffer include reduction in smoke from the extinguished candle, and less char on the wick when you're ready to relight it. After extinguishing any candle, make sure the wick and wax are cool before putting it away. Store candles, new or used, in a cool dark place. Excessive heat in storage can warp the wax and make the wick unstable. Place the lid on a container candle between uses to keep dust, pet hair, and other debris away form the wick. Tapers, pillars, votives, and other candles without containers should be stored in a container with a lid to keep them clean. Check the wick before relighting a candle to make sure that it's 1/4 inch in length. Make sure the wick is standing straight up before relighting. Whether your candles are brand new or have been stored for several months, taking a moment to check and maintain the wicks will ensure that they will burn well and provide long-lasting scent.